Market Manila - Rainy Day Comfort Food… - Beef/Lamb, etc. A quick diversion from posts on our trip to Spain (to resume shortly) just to let you know what we are eating when the heavy rains start falling. Last week, this incredibly satisfying bowl of beef sinigang… I spotted some nice looking Australian beef brisket at the grocery and thought it was worth a try (I was hoping its increased price and good looks would yield a more tender cooked beef). I placed 1.5 kilos of brisket in a pot and covered it with cold water and set it on high heat and as soon as it reached its first boil, turned off the heat and rinsed the meat. Placed the meat back in the cleaned pot, covered with more cold water, and let this gurgle over the lowest of flames for some four hours until the meat was as tender as it was going to get. It was mostly tender, but I realize now that after that long on the stove, you are probably just as well off if you used local beef brisket from a good source… The broth was delicious, meaty and flavorful, and a nice clear yellowish brown tinge from the slow cooked gristle or muscle tissues. Once it had achieved the desired level of tenderness, I added some freshly made from scratch tamarind puree/broth, adding as much as your personal sour-meter can handle. I let this simmer for a few more minutes, then added in sliced radishes, mild chilies, long beans, eggplant and water spinach. Serve very hot. A little dayap, chili and fish sauce on the side. Lots of rice at the ready. Want to see more sinigang recipes? Head to this post and scroll down to a list of more than a dozen sinigang posts previously featured on this blog. MM, for pork/beef sinigang, i first saute the meat in garlic, onions and tomatoes and season it with patis before tenderizing in broth. the finish product tastes much better that when the meat is simply boiled. like sinigang with gabi and lots of okra. and yes, i make my tamarind broth from scratch. any extra tamarind extract is frozen for later use. sigh…makes my mouth water just thinking about it…any sour broth for me is perfect food for rainy days.Or any day for that matter. Mmmm … that looks scrumptious! It is a blazing 40 degrees out here at the moment though, so it is all outdoor grilling and cold side salads and picnics on the lake right now. Cheers! my father-in-law makes a mean beef sinigang! it is a fall / winter comfort food for me. i love this is patis on the side and lots of (white) rice, like you said. 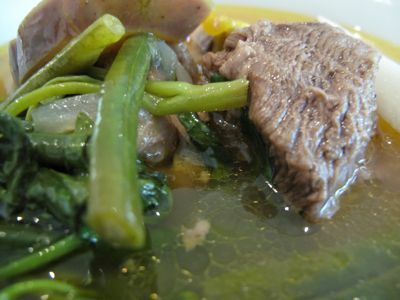 Mr.MM beef sinigang is my favorite,like sonny sj ,my mom also used to saute the beef before bringing it to a boil. She calls this dish sinangkutsang baka. We have a sampaloc tree before,yun ang pinakamaasim,even if the fruit is ripe,still super asim! Would there be any difference in tenderizing the meat? Coz I always boil water first before putting the meat in the pot, then cook for 2 hours or until tender, exp. with nilagang baka. Any tips would be great. LOVE LOVE LOVE SINIGANG! Haven’t had it in a while….time to cook! Thanks for the inspiration! Four hours? :) wouldn’t it be better to use a pressure cooker to cook stuff like these? won’t it be the same slow cooked tenderness? Your sinigang sure looks delicious. :) I just made some last week with fresh prawns and kamias. It was the perfect thing for a rainy day. I love this with mayatbang (ever heard of this tuber)! Oooh, even better in sinigang sa bayabas!!! Waaaahhh, homesick na naman ako!!! 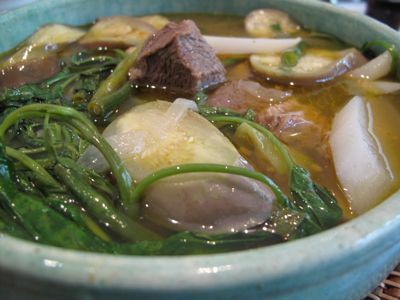 Gosh, just the thought of sinigang makes me drool, MM. I’ll probably cook sinigang for lunch tomorrow. I agree with you regarding those ready to use sinigang mix. I used to buy them too until recently, I found a block of tamarind cake from Thailand. It has a very long shelf life so I have been using it for quite a while. It’s definitely better than the powdered stuff because it was not packed with lots of salt. what a coincidence! we had shrimp sinigang for supper this rainy night, with fresh mustard leaves. when i make bangus sinigang, i first saute garlic, sliced onions and tomatoes, add 1-2 tbsp. of miso (i buy the packaged japanese brown miso) and saute everything together until the tomatoes are mushy. then i add water, let it boil, and add the fish. lastly, the veggies. my hubby and kids, though, do not like sinigang sa bayabas, so i get to eat it only in my mom’s house. Yum! Sinigang of any kind is always delicious haha but my favorite sinigang is the one soured with kamias! The sharp hit of sourness and the subtle sweetness of kamias is oh so perfect for my taste buds. nagutom tuloy. mapunta nga sa seafood city at makabili ng pinoy food. I noticed a sort of type-casting operating in the choice of dish certain main ingredients will be turned to. For example, the sinigang sa miso with mustasa that Millet mentioned above almost invariable was only applied to kanduling bungulan (salt water catfish) where I came from. And Japanese miso whether white or red (shiromiso or akamiso) are superior by far to the local one. I also use them where I want the taste of soy sauce but where the dark coloring it imparts will be a distraction. Ang sarap! It’s going to be about 100 degrees in the shade here today, but I know we’re having beef short rib sinigang for dinner. Inspiring! To MOM-FRIDAY, I think the reason why MM boils it first then throws it away is to get rid of the “scum” or that fatty, brown whatever that comes up when we boil meat. @ Mom-Friday – Actually the chinese also do same kind of procedure as MM when making meat soup which is called parboiling. Parboiling the meat will get rid of the blood , some fat as well as other impurities. This is why chinese soups are clear without the froth and bits that makes the soup murky when you add raw meat or bones without parboiling first? The froth and bits floating on the surface are the same thing that we slowly remove when we are boiling meats so the chinese just make their life easy by just simply throwing the first boiled water and washing the meat. Hmmm the old time comfort food. 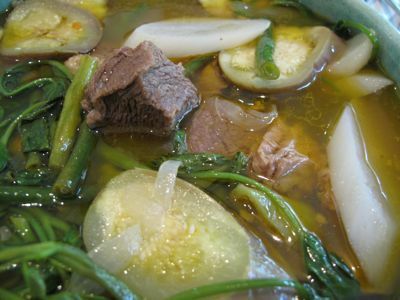 My father makes beef sinigang with mayatbang..
@charlie, how nice to find someone who knows mayatbang! I also love sinigang sa alibangbang for beef…kamias for prawns and other fish…sampalok for pork and bulaklak ng sampalok for chicken…We even use santol for bangus…I love the whole range of pansigang that I’d rather go without sinigang than use the powder form. But I found out that raw gooseberry can substitute for kamias, though. This is always a go-to for me. I love sinigan. As with the commenter who brought up batwan a long time ago unaccompanied by even a skimpy description or clue as to its nature, I asked is it a plant, an animal or mineral, what pray tell is mayatbang? Describe it, use metaphor or simile, slake our thirst for knowledge. I recently used beef ribs for our weekly sinigang and it was awesome! When using the miso as sawsawan	for fish sinigang, is there a way to prepare it? Quiapo, I have seen it done only in Japanese and Korean restaurants. Red miso which comes as an almost solid paste is cut with a little bit of water to make it spreadable. In Filipino cooking, it is sautÃ©ed with garlic, onions and diced tomatoes and served as the traditional accompaniment to pesa. Unfortunately, the Philippine miso we get here (in Toronto) appears to be poorly processed, of inferior quality and consistency and looks like irregularly cracked soya beans. I avoid it. Footloose, the little that is on the net about mayatbang suggests it is a tuber, like or similar to taro (gabi) or cassava. At for katmon, this seems to suggest it is native to the Philippines, but then again, I have never seen the fruit or tree nor do I know much about it. Mr MM & Footlose.. Mayatbang is a root crop that is like kamoteng kahoy. I called my father and he said he normally buys them by the road to Pililla Rizal or Taguig FTI market. Charlie, thanks, see I though it was a souring agent. MM. Footloose: A farmer neighbor of mine in Quezon Province has a 30 year old Katmon tree which yield every year bountinful katmon which everybody ignores. On my annual visit there, I always make it to a point getting some of the fruits and eating it raw with salt and often wonder if I can use it for sinigang. I then asked my cousin caretaker to plant about 2-3 of this tree and he said only the birds can pick the right seed and drop it to ground. Well, I will research it more about this tree, since now I realized that this is only found in the Philippines and is considered endangered species. @Footloose, I can describe mayatbang as a tuber that grows long and burrows deep n the ground. It has white skin with small brownish dots. It doesn’t have a “tree” like cassava that one can cut into footlong sticks for planting. They just grow out there—somewhere in the forest. I am afraid I cannot tell if its plant is like that of a potato or a vine like ube (Father is no longer here to furnish that info). I haven’t heard mayatbang being domestically cultivated because I remember my father digging for them in the dense forest part of our farm in Antipolo, Rizal. Its flesh is very white when peeled and has a slippery consistency; it’s taste is nothing like gabi—more like ube. If one wants to buy them in the public market, one must be early because only a handful of small farmers have them…I wonder if only the Tagalogs know of this wild ingredient. Atbnorge, thanks. Sounds like yam. If it is indeed yam, it should be yummy then. Charlie and Atbnorge, could it be this? Footloose mayatbang is about 18 to 24 inches long and about 3 inches in diameter(not a perfect circle). Tugi is a small root crop compared to mayatbang. We had some last April while I was in Manila. My father bought them from a vendor in Morong, Rizal. Just talked to my father he thinks it grows wild in the mountains of Rizal and Laguna as Atbnorge mentioned earlier. @MM & Footloose, you’re curious, eh…That tuber in the link is what we call tungo. It is not mayatbang. The longest mayatbang I saw was nearly half a meter or maybe more because Father had to cut it…It’s like gold for a farmer because it is guaranteed sold the moment one finds it. Good luck on your quest, MM!